Before Sigmund Freud made dreams the cornerstone of understanding an individual's inner life, Americans shared their dreams unabashedly with one another through letters, diaries, and casual conversation. 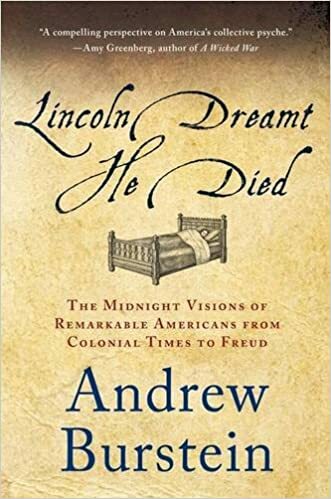 In this innovative book, highly regarded historian Andrew Burstein goes back for the first time to discover what we can learn about the lives and emotions of Americans, from colonial times to the beginning of the modern age. Through a thorough study of dreams recorded by iconic figures such as John and Abigail Adams, Thomas Jefferson, and Abraham Lincoln, as well as everyday men and women, we glimpse the emotions of earlier generations and understand how those feelings shaped their lives and careers, thus gaining a fuller, multi-dimensional sense of our own past. No one has ever looked at the building blocks of the American identity in this way, and Burstein reveals important clues and landmarks that show the origins of the ideas and values that remain central to who we are today.